silver strands: brilliant move ... or dismal failure ..??? brilliant move ... or dismal failure ..??? We lived in a town of 9,000 in Southeast Alaska for 12 years. That's where we pretty much raised our kids. A couple of times a year we'd save up, hop on the ferry for the 9-17 hour ride to Juneau (depending on the # of stops we made along the way) and shop our little hearts out. We thought Juneau was the shopping Mecca - a metropolis. Anyway, it's not like there was no shopping in Sitka. There was. There was one discount store that catered more to tourists, but to be honest - they did have a small line of clothes and toys. And there was one store that was all about girls - jewelry & clothes. Trendy, in fact. BUT it would cost our entire Juneau trip to buy one dress there. I had my daughter-in-law bargain shop "down south" (the lower 48) and ship the affordable, trendy clothes up to me. We began with prom dresses and expanded into a small line of shirts, jeans, skirts, sweaters. The local florist gave us a corner of her shop. Business was slow going. Really slow. But we stuck it out. For about a week. At which time she apologetically came to us and told us that the other businesses were going to squeeze her out if she didn't get rid of us. Apparently they didn't like the competition. Next, we made a deal with another business owner - her shop was a bit of the beaten path, but she was someone who couldn't be messed with. It was next door to the pizza joint, so we hoped we could gather a little business that way. It was short lived. It just didn't fly. It's interesting: The prices were "down south prices" ... but it didn't draw in huge crowds. Why? My un-scientific study taught me that we all get comfortable in our lives. Like the monkey who won't release his fist as he holds onto food through the hole in the monkey trap, sometimes we get comfortable with what we're used to and we won't open our eyes to what might be better for us. Makes me wonder what I've closed my mind to. And it's made me more aware and helped me to step out of my comfort zone more often. 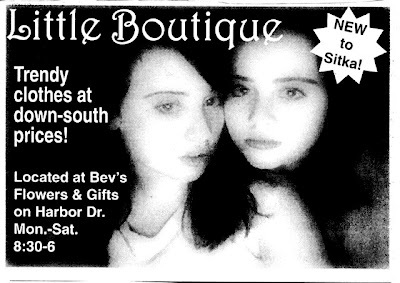 So the Little Boutique ... in the end I was in the hole about $700. Plus the work we put into it. It appears to have been a dismal failure. But would I pay $700 to have learned to open my life to what the world offers? I love your perspective. It's all about the journey, not the destination.